Modesto area art aficionados have eagerly been counting down the days until the soft opening of Tri Chromatic Gallery on January 20Th. Breaking down barriers, the inaugural experience, WALLS invites guests to participate in a silent auction of artwork and massage work and enjoy cocktails with the gallery owners between 6pm – 9pm. Cocktail attire is encouraged. All three artists have been in enough galleries to know and have an idea what they like and want to see in their own space. Having a local gallery run by local artists will perhaps take some of the pressure off of the local art community with its diversity. The trio have already carved out a space on social media and made a presence for the gallery to allow the community to see who they are, the artists that will be featured and what their creative processes will be. 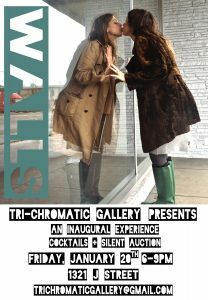 Tri Chromatic Gallery is a unique community opportunity and Modesto is warmly invited to expand their palette for an evening. Hopefully the taste of something new will leave everyone wanting more.